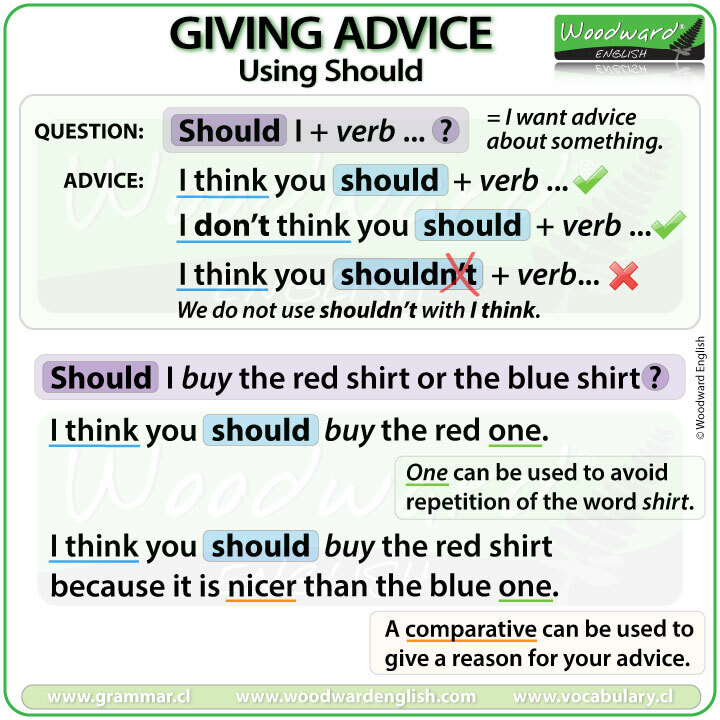 In English, one way to ask for advice is using the modal verb SHOULD. We can make this type of question using …. How can we GIVE advice in English? One common way to respond to a question with SHOULD is to also use SHOULD in the answer. * Remember, as mentioned in the last lesson, the verb is in the base form of the infinitive. I DON’T think you should + verb. I don’t think you should go. I don’t think you should stay. I think you SHOULDN’T + verb. (No, this is NOT correct). In English we do NOT use shouldn’t after I think. Should I buy the red shirt or the blue shirt? Here I am asking for your advice about which shirt to buy. I think you should buy the red one. You can say… buy the red ONE …or… buy the red SHIRT. ONE can be used to avoid repetition of the word shirt and sounds more natural. I think you should buy the red shirt because it is nicer than the blue one. Nicer is a comparative adjective. We are comparing the red shirt with the blue shirt. When giving advice a comparative can be used to give a reason for your advice.